It’s the 21st Century business owner’s worst nightmare: You sign on to your company’s Yelp page and see that someone has left an absolutely scathing review. This can obviously take its toll on your ego, but this is about far more than mere vanity. The truth is, negative Yelp reviews can have a real, bottom-line impact on your business; they attract search engine users and effectively set the public perception of your brand. But while a bad review can have devastating effect, it can also provide you with a great opportunity to do some customer outreach, damage control, and brand enhancement. It all boils down to how you respond. First, put the review into perspective. There’s no question that a bad review can be harmful to your brand. We don’t want to sugarcoat it, but we also don’t want to overstate it. A litany of bad reviews could honestly sink your company, but a single bad review amidst dozens of positive ones is probably not going to be a big deal. Regardless, it’s important not to panic, or to let your emotions carry you away. Respond rationally and with a level head. Also respond with all available information. Read the review carefully, noting its tone, the specific complaints, the date of the review, and any other information about the incident posted. Make sure your response addresses the review with precision and accuracy. If you come across like you Just Don’t Get It, it will only make things worse. 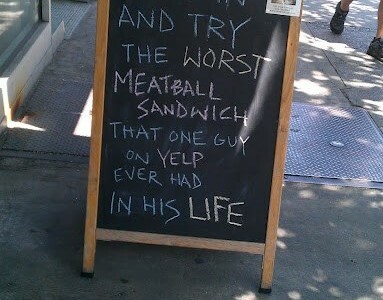 Also research the Yelp reviewer, if possible. (For anonymous reviewers, you’ll be out of luck.) Is it someone who always leaves nasty reviews? If so, then maybe that can help your anger subside. You could just be dealing with a mean-spirited person, quite frankly. No reason to get your feelings hurt over that. Whether you feel like the negative review is warranted or not, it’s important to seize the opportunity to treat your customer respectfully; apologize, and ask what you can do to make the situation right, or at the very least offer an explanation and sincere remorse that the customer’s experience was not better. Remember who you’re writing for. In any and all writing, audience is important. When you’re addressing a Yelp review, remember that 90 percent of the Yelp audience is people who just read reviews, not people who write them, and that most of these people still have an unformed opinion of your company. That’s who you’re writing to, really. That’s who you’re trying to impress. Showing warmth, patience, and a customer-centered perspective can more than make up for the bad review itself. Every now and again, you may see an all-caps, foul-mouthed review that’s obviously just designed to be incendiary. Yelp does a pretty good job of filtering these out, but if you do run across one, it may be best not to engage at all. It’s hard to come across well when you sink to the level of addressing flamers and hotheads. A bonus tip: You can enhance your brand’s reputation and minimize the damage of a bad review by providing your customers with plenty of positive content. To learn more, contact Grammar Chic today at www.grammarchic.net or 803-831-7444.